Evergreens serve many purposes in the landscape. Not only do they create beautiful textures and focal points but they provide safe haven and shelter for our wildlife like nesting birds and other small animals. They also let us enjoy their beauty all year, long after all the other trees have dropped their leaves. In a time where Leyland cypress have been overused like Bradford pears, the Green Giant arborvitae is a fresh alternative to the Leyland with less potential problems down the road. Leyland was only good for a screen but the tapered pyramid shape of Green Giant makes it a great specimen plant or screen. It holds a tight uniform shape, grows quickly, prefers full sun to partial shade and requires no pruning. This tree made it onto the Top 10 Landscape trees list. As a horticulturalist, I remember going to Washington state and driving through the state and up to Vancouver Island and seeing these magnificent trees. Having not been to Oregon to see the Redwoods, this tree was certainly the largest tree, by far, that I have ever seen. The variety Pseudotsuga menziessii var. glauca is used for Christmas trees for its ability to withstand harsher conditions. It takes 7 to 10 years to grow a Christmas tree and it is one of the most used Christmas trees in the United States. 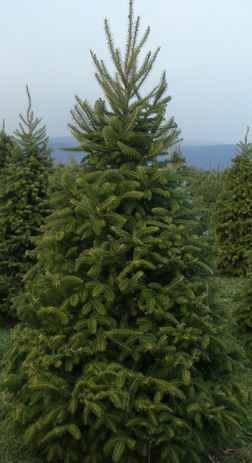 It has soft needles and not very ridged branches and it handles ornaments better than a White Pine but not as well as a Frasier or Noble Fir. Put a fresh cut on the tree and keep its stand filled with water and it will last well past Christmas with minimal needle drop. This beautiful conifer was one of the first Christmas trees planted live in the yard of my childhood home in Atlanta Ga. They were planted under a canopy of pine trees and not given a single day of attention for the 18 years I lived there. These majestic trees were over 30 feet tall and just beautiful and healthy. As an adult, I planted these trees in my current home, on the wood line, under my oak trees, behind my azaleas. Here in Georgia, these beautiful trees grow native in the mountains. These trees grow all throughout the rocky slopes of the Appalachian mountains, from the foothills of Georgia to Maine. Canadian Hemlock also develops tiny pine cones and is the state tree of Pennsylvania. No parts of this tree are poisonous but no part of it taste good either. I planted 3 of these between the neighbor and I 14 years ago and they were getting a decent amount of shade from my maple tree and his sweetgum tree and they are now almost 20 feet tall and doing well. They also tolerate heat very well and have outstanding drought tolerance. This tree starts out conical like the Leyland cypress but then broadens out more like a Christmas tree. This tree does better in Southern regions of the United States and makes a good windbreak and also good for erosion control. This tree is distinctive, as it has symmetrical branches, soft blue needles and long slender pine cones. It also grows in a pyramidal shape, its branches grow all the way to the ground and its blue needles grow about 5 inches long and in bundles of 5. It makes a great screen in the landscape and also works well as a windbreak. As a Christmas tree it has soft branches that struggle to hold heavy ornaments and will certainly drop needles quickly if you choose to cut this tree. Keep the roots on it and keep it with water and it will do fine in a bucket in the house for a month but then get it planted in a sunny location in the ground. This tree has a beautiful blue color with stiff, tiered branches for holding snow. This tree grows well in colder climates and will struggle in the Deep South where there are hot summers. This tree is a slow grower that can grow over 60 feet tall. Blue Spruce makes a great specimen tree as well as a great screen or windbreak. 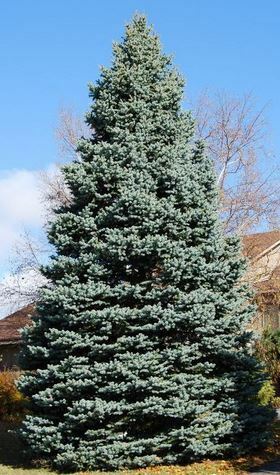 Blue Spruce is the state tree of Colorado. 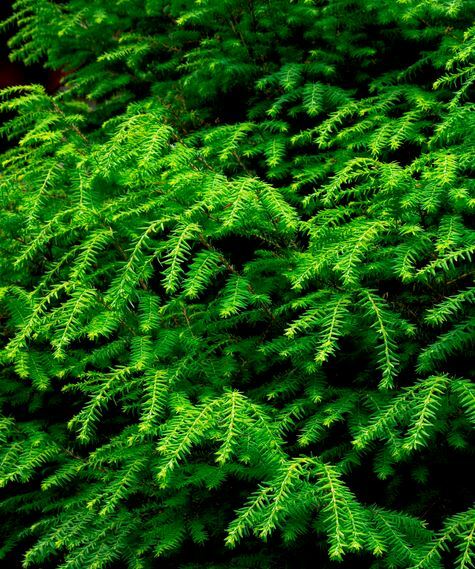 This beautiful pyramid shaped evergreen has great drought resistance and has brilliant silver and green color. It is a relatively fast grower, making it ideal for a screen. This trees brilliance makes it a great focal point in any landscape. Its toughness and ability to grow just about anywhere also makes it a must have for the yard. This tree also requires no maintenance once it is planted, other than watering. This tree made it onto the Top 10 Landscape trees list. Due to its very quick growth rate and its ability to create a big screen, Leyland cypress has become one of the most commonly used plants around. Leyland Cypress has proven to be tough as nails, with few problems. There is one disease that can seem to be problematic to the Leyland around times of drought but to this day, the Leyland Cypress still proves to be as tough as they come. This is a medium sized tree that is dense at a young age and the preferred cover for animals like deer, owls and rabbits. Its needles get from 1.5 to 3 inches long, that grows in twisted pairs and produce small 2.5 inch oval pine cones that are loaded with seeds and preferred food of birds which help spread the seeds. This tree grows very fast and can quickly beat out other trees when taking over fields. This tree is very adaptable to different soils and grows in places other trees cannot tolerate. This tree grows natively around the Appalachian mountain area and is called a pioneer species due to its ability to take over disturbed land areas. Because its inability to tolerate shade, it is often taken over and killed by aggressive reforestation of hardwood trees. Virginia pine is monoecious, having male and female parts to pollinate itself. In open areas this tree can produce cones in as early as 5 years and in dense cover it can take up to 50 years. This tree can be found on tree farms, trimmed as Christmas trees and would be best planted somewhere a quick growing windscreen or privacy screen is needed. This tree is preferred by woodpeckers as a nesting habitat. This tree is a country tree and just not cut out for big city life. It does not tolerate urban pollution and does not like being a street plant. It needs fresh air, moist soil and cool summers. It likes full sun to partial shade and prefers a somewhat sheltered location. This tree grows native in higher altitudes in the mountains of North Carolina, Tennessee and Virginia. As a cut Christmas tree this one has been tried and true. It holds its needles longer than most cut trees and has more ridged branches that won’t bend with heavy ornaments as easy as the Douglas Fir. Norway Spruce seemed to hang in there well with the Canadian Hemlocks and the Deodara Cedar. This tree is considered to be a fairly fast grower and since it is cut out for cold weather, it would grow quicker up North. There are more than 200 different cultivars and in cooler climates, they can grow to be well over 100 feet tall. This makes for a great topiary or container plant, just be sure that the pot has plenty of drainage holes and a good quality potting soil that drains properly. Because it grows so slowly, it would not create a good screen but makes for a great specimen tree in rock gardens or Japanese gardens. Also makes for a good miniature Christmas tree. For a tree inside the house, you might want to read Maureen's post on The Perfect Fresh Cut Christmas tree. But I think some trees are need to be prune in order to prepare for Christmas after seeing all the images. And some trees are good to use instantly.